Add your own Tips, Strategies, & House Rules! Vote for tips that you think are useful. If you can’t stand the priority rule with ranged weapon, causing your character to hit your allies before zombies on the same case, here is a house rule re-balancing the game if you want to ignore it. Limited ammo : The priority rule when shouting with a ranged weapon doesn’t affect your allies anymore. In return, characters have each an ammunition stock. You can use the ability marker tokens to represent your munitions in stock. Each time you shot with a ranged weapon, discard 1 ammunition token. Using a dual weapon only cost 1 ammunition token per shot. The player starting with pistol get 10 ammunition token at start. every time a player find a ranged weapon with searching action, he gets 10 (or 5, as you prefer) ammunitions tokens with. Characters can trade their ammunition token with the trading action. I really enjoy this rule, it become easier to shoot zombies, but the survival immersion is way better when you have to save ammo! 🙂 Try it and have fun! I wondered why the toxic blood spray has just an effect on the attacking survivor when more than one is standing there so my rule: if you are killing a toxic it explodes and damages all survivors in the same space (Got the idea while playing dead island. because suicide zombies explode instantly killing you). 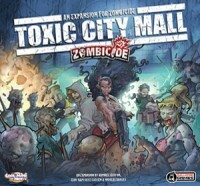 Toxic city mall comes with only 29 toxic zombie miniatures. Especially in the missions where you have to place toxic walkers in mall areas during the initial setup, we found that running out of toxic walkers can happen really quick. To prevent toxic walkers (as well as the other toxics) gaining extra activations because of running out of miniatures, it is best to try and eliminate them as soon as you can. Background: So my survivor got devoured by a ginormous pack of zombies and when resurrected it would be impossible to survive – I could not walk away due to the massive amount of zombies, and when wounding me, making me a zombivor, they made me drop all my weapons (only had two) so in the next round I would be eliminated without even a chance to play my Zombivor- what to do? Ever seen that scene in Walking Dead where the survivors cover themselves in zombie blood so that the zombies won’t smell them? The principle for this house rule is the same. House Rule: A Zombivor is regarded as semi-slippey; that is to leave a zone with zombies one only spends one action regardless of how many zombies present in the zone, because a Zombivor is smelly, almost like a zombie, so that they are tricked (however not fully – that’s why it costs one action, instead of being fully slippery).